With a full range of innovative binding solutions from brands like Duplo and FKS, we've got your commercial binding needs sorted. The Duplo range of collating machines allows your business finish booklets and prints quickly and efficiently. These Duplo creasing and cutting machines will take your digital print finishing capabilities to a whole new level. Duplicating systems offer the benchmark for productivity, economy and environmental sensitivity in high volume document duplication. You can stay a cut above the competition with a cutting-edge Mohr guillotine or Ideal digital cutter from Neopost Ireland. Capable of handling a wide variety of laminating applications, Komfi offers the leading technology in its class. From straightforward, high-volume single fold applications to intricate cut, fold and perforate combinations, Neopost can find the right piece of kit for your print business. Take your booklet-making capabilities to the next level with our range of state-of-the-art booklet solutions from Duplo. With a wide range of high-margin applications, Roland wide format printers suit the varying needs and demands of graphics and speciality imaging professionals. Versatile and easy-to-use, this range of cutters gives you the ability to create professionally cut graphics that your customers will admire. Hot or cold, roll-fed, wide-format laminators that offer the perfect solution for large format laminating applications. Designed to revolutionise the speed, accuracy and convenience of the finishing process, cutters are a godsend to the busy wide-format print producer. Comagrav cutting systems for oscilation, knife cutting, creasing, routing and more. Allow your business work more productively and cost effectively with a cutting-edge print solution from our exciting EFI product portfolio. The JETRIX UV printers from InkTec are the perfect solution for indoor, outdoor and industrial solutions. This Italian manufacturer prides itself on a spirit of innovation, passion and excellence; a spirit that really comes through in the folders, trimmers and laminators that they produce. We can provide you with a fantastic range of premium paper & media products from brands like Torraspapel and Ambassador. We have put a huge amount of time and effort into sourcing the best possible substrates. Neopost provides all of the bits and pieces you need to keep your kit ticking over. From blades and wipes to clips and clamps, we stock a full range of print finishing consumables from leading brands like Duplo, Roland, Multigraf, Mohr & FKS. Neopost carries a full range of vehicle wrap and vehicle decoration media from leading brand Hexis. With a massive selection of products across monomeric, polymeric and cast vinyls, we've got everything you need for transforming vehicles. We can provide you with a fantastic range of premium paper & media products from brands like Torraspapel and Ambassador. Our commitment to service is based on a belief that our customers deserve more than just a great piece of equipment. That's why when you choose to work with Neopost you get so much more. We believe that the most important factor in creating happy customers is providing great people to deliver the exceptional levels of service and support that our customers deserve. Set up exclusively for Neopost customers, with European headquarters based in Dublin and a portfolio of 80,000 agreements across Europe, Neopost Finance offers flexible rental options across the entire range of Neopost products. If you've got questions about what we can do for your business you might just find the answers here. If not, don't worry. Just get in touch and we'll do our best to find the answer. Get the kit you need fast. Neopost Finance offers flexible rental options across the entire range of Neopost products. Neopost gives you with the same local knowledge and industry experience that you would expect from a long-established player in the Irish print sector combined with the resources and support of a truly global partner. When it comes to print and finishing equipment suppliers, few players in the Irish market can boast the level of industry experience and local knowledge that our team can deliver. We have established a dynamic team of knowledgeable, ambitious and enthusiastic print professionals who love what they do. That is why our print and finishing business is going from strength to strength. All of our sales, marketing, service, finance and other operations are based at our head office in Dublin 22. This means that you are guaranteed a speedy, local service with no infuriating calls to overseas call centres. We work with print operations of all shapes and sizes - from small, corporate print rooms to large, multi-national commercial print providers. Super wide printers aren’t just for those with significant budgets to spend on new kit. This newcomer is shaking things up and opening the market to a larger client base. 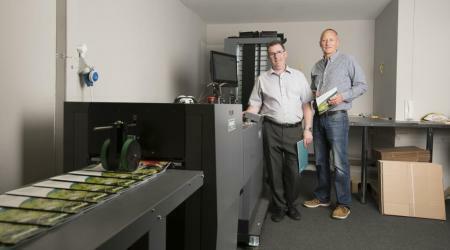 Large format JETRIX printers are manufactured by InkTec and sold in Ireland through Neopost. Xtreme Signs and Graphics has acquired the JETRIX LXRi320 Roll-to-Roll LED-UV printer and has already started to reap the benefits for its business. You don’t have to talk about the JETRIX LXRi320 for long to understand the huge benefits it brings to wide format printers in the market. A 2.5m x 3.2 metre full colour print can be completed in around 20 minutes in photorealistic quality. This is because the LED ink is placed on top of the media and doesn’t sink into it – giving the print an added vibrancy and preventing cracks. Pierre Phieffer is the owner and Director of Xtreme Signs and Graphics based in Dublin 12. Until recently, Xtreme Signs and Graphics was using a Chinese manufactured eco-solvent, low end, entry level machine for 3.2 metre prints. This machine was slow, causing a bottleneck in production and change was sorely needed if the company was to continue meeting the strict and demanding deadlines asked of it. Pierre contacted Fergus Byrne, a trusted supplier from Neopost Ireland, who recommended the JETRIX range. Together they travelled to the FESPA Global Print Expo in Germany and while there, spent time at the JETRIX stand. Pierre was interested in the latest roll-to-roll machine which was still in testing at InkTec’s global base in South Korea and together they travelled to South Korea for a demonstration. Pierre explains that “within five minutes we knew it was perfect. It was exactly what we were looking for.” Pierre had brought samples media to South Korea, tested them on the machine and brought them back to Ireland to make sure there was no stretching or ink cracking which can be a problem. More frequently customers want speedy, next day or in some cases same day turnaround and will shop around until they find somewhere that makes that possible. Meeting those standards are possible with the JETRIX LXRi320. It also comes with a profile package which Neopost provides, that profiles the media ensuring the colours come out as they should, eradicating the requirement for expensive reprints. Xtreme Signs and Graphics recently sent 100 panels to a show and none came back incorrect. The use of LED ink also makes the print quality from the JETRIX LXiR320 far superior. Previously, ink would not have always adhered well to the media which can cause it to crack. Therefore, the texture of the media would have had a bearing on the colour, potentially dampening the whole print. The JETRIX LXRi320 is available throughout Ireland from Neopost Graphics. It is ideal for wide format print companies who want to speed up their printing service while not compromising on quality. 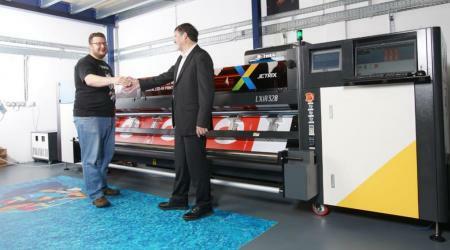 The JETRIX LXRi320 is available throughout Ireland from Neopost Graphics. It is ideal for wide format print companies who want to speed up their printing service while not compromising on quality.